Roland of Gilead is on a quest to find the dark tower. Not just any dark tower – THE dark tower. Armed with his considerable skill as a gunslinger his first order of business is to catch the man in black. Intrigue, mystery and a whole lot of freaky stuff surrounds the first phase of the epic pursuit. Success requires every bit of Roland’s cunning and single-mindedness and in the end, merely catching up with the man in black turns out to be the least of his problems. There’s really no other way to say it; The Gunslinger is an impressive novel. While it’s not our favorite Stephen King novel (Bag of Bones please stand) or even our favorite in the Dark Tower series (review for The Wastelands coming soon), the reader has the sense that something momentous is happening. This novel does an excellent job setting the stage for so much more to come. We were left dripping with enough intrigue and unanswered questions, that continuing on with the series was an easy choice. Stephen King has never had any problems writing characters and the cast of The Gunslinger could very well be his best. Roland, in all his cold hearted splendor, was such a deep character; and Jake, in all his trusting naivety, provided the perfect compliment. The setting of the novel was also top notch. The reader is asked to accept so much as reality yet we found ourselves questioning little due to the confident and colorful manner in which the setting is described. With 7 total volumes currently in the series and another one waiting to be released next year, there’s never been a better time to begin The Dark Tower journey. Editor’s Note: Make sure you take note of the content rating... Very little is left to the imagination. 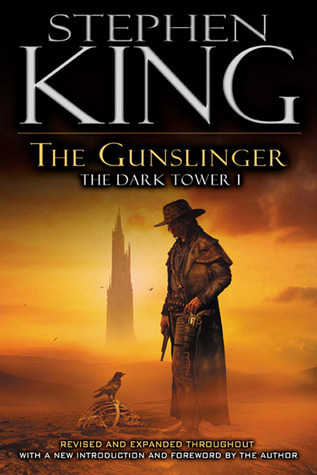 I LOVE Dark Tower series, one of my favorite series ever. Can't wait for the movies and tv show :) Glad you liked the first book! Oh my gosh, I love that you loved this! The Gunslinger was definitely not my favourite of the 7 books (they sort of just keep getting better and more incredible- except Wizard and Glass, which I didn't like quite so much) but I love the entire series so much that I'm very concerned about reviewing it myself because of all the gushing that's going to happen... like in this comment right here! Hehe, but yes, I'm really glad you enjoyed it! I finished this series in one breath-gasping, ravinous stint! I got through one and Had to have the next. my girls read it the same way. We still say of something "it's 19" or "doesn't matter, there are other worlds than this"
As far as King is concerned, this is a magnum opus work for sure. It's like none of his other writing, yet full of so much of his other writing. Wizards and Glass was my fav of the series. The Stand of his other works. And you pegged it, King is KING because his characters are incredible! I read this series - at the insistence of a friend - over a few months back in 2005. I'm glad to hear you're enjoying them, as I did. They were very hard to put down, and as soon as I finished one I would be anxious to start the next. I also enjoy how they tie-in to some of his other works, e.g. Hearts of Atlantis (maybe my favorite King....). Happy reading! The Gunslinger was not a good read for me. We are a couple of harmless Bibliophiles looking for an outlet. We have a passion for GOOD literature and enough random thoughts to fill up a blog. We have two young children and more books than are probably healthy. What the Heck is Two Bibliomaniacs??? Subscribe via your favorite reader!!! read 0 books toward a goal of 101 books. I'm Moving - to Wordpress! I'd let him turn this in as an assignment, if he paid me.